We know men don't like to clean, but the number of times they will walk through the house to visit a fridge full of beer is quite substantial, hence we can never call them lazy either. 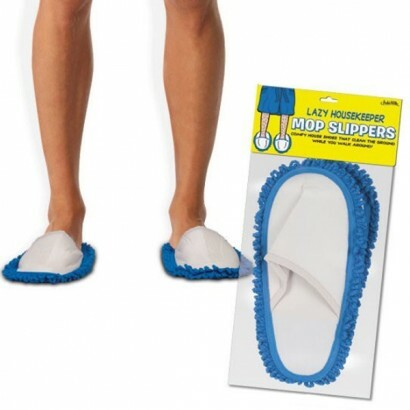 The Lazy Housekeeper Mop Slippers are the pinnacle of innovation, cleverly combining cleaning with laziness. Slip feet into these comfy slippers and clean the floors each and every time you walk. Get beer - clean the floor, find the remote - clean the floor, search for a takeaway menu - clean the floor. Never before did one man earn quite so many brownie points with the Mrs...and we all know what brownie points get us don't we?